By Mary Elizabeth Williams“The Colbert Show’s” entire shtick is based on the parody of the right-wing blowhard, and as such it’s consistently taken clever jabs at the issues of race in our country. And it’s understood that if you want to have a successful, middle-aged white man take on these topics, there’s something to be said for dressing him up as a character. Yet as a colleague wisely noted this morning, there is a limit to how much these Caucasian male-dominated venues like “The Colbert Report” and the Onion can get away with on the subject of race. And most of us with any sensitivity whatsoever understand that one person’s biting satire is another’s insult. The only thing that distinguishes a joke is whether it works or not, and in this case, what got a laugh on TV fell flat on Twitter. It’s reasonable to point these things out, and to point them out in the context of how the media represents these issues in general. By Neil DrummingCritics of the tweet say it violates a cardinal rule of satire, which is that it fails to target power and/or authority, but instead goes after the oppressed. That may be true of the words excerpted without proper context. But if you watch the entire routine that aired on Comedy Central on Wednesday night, it seems fairly obvious that Colbert and his writers are going after a deserving target, that is, Snyder et al. So, when you think about it, it’s really Twitter that ruined Colbert’s totally legitimate dig. (I don’t suppose anyone’s down to get behind #CancelTwitter at this point, though.) Someone at @ColbertReport probably should have realized that not all of the long-winded host’s humor can be disseminated as bite-size chunks. Honestly, the best part of the joke—a tag about triangle hats—didn’t even make the feed. Maybe someone at the office should be held accountable for not knowing how Twitter works—but that doesn’t sound like a firing offense. I mean, really, “The Colbert Show” has given us so much pleasure over the years. Others thought the "joke" went awry. Whether they agreed with #CancelColbert or not, they were with okay with criticizing Colbert's insensitivity. By Brittney Cooper[W]hite people do not have a history of being devalued as white people on the basis of the slurs. Yes, Irish Americans, Italian Americans and Polish Americans in the late 19th and early 20th centuries were frequently the object of ethnic epithets and discrimination. But as those groups “became white,” whiteness itself became what Cheryl Harris calls a form of property, a protection against racial devaluing. So when Colbert, a white male, uses these slurs, even in the mode of critique, he steps into incredibly muddy water, and surely cannot expect to come out unsoiled. In other words, I’m saying that though the bit was intended to critique racism, it failed. Yes, Colbert was spot on in his analysis of the ridiculousness of Dan Snyder’s “Original Americans” Foundation. But to paraphrase one of my Twitter-locutors, Chris Robinson, you can’t make Asian people collateral damage on your way to proving a point about racism toward Native people. And what we should understand is that as satire goes, there is the thinnest of lines between critiquing racism and reinforcing or reinscribing those very stereotypes. 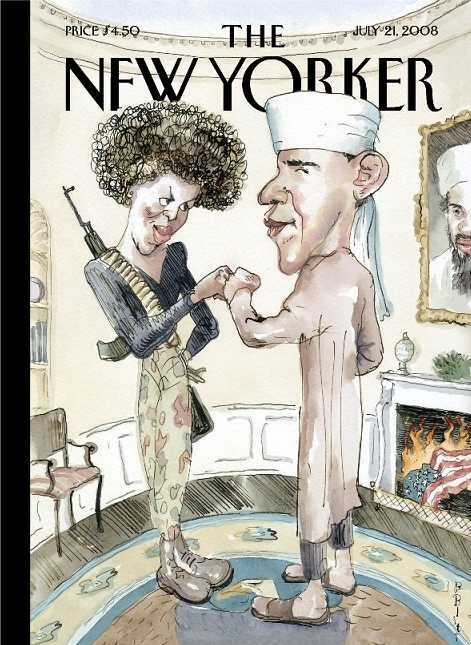 Remember the 2008 cover of the New Yorker, called “The Politics of Fear,” that attempted to satirize the range of racist mischaracterizations of the Obamas. It communicated the absurdity of those stereotypes, but did not communicate an alternative narrative, that would effectively combat the stereotypes at hand.And:If Colbert had used the N-word instead to prove his point about Natives, we would have been outraged. And we would have seen #CancelColbert as the only appropriate response. Yet, many of the folks I dialogued with felt that calls to cancel the show were too much, and suggested that an apology was more appropriate. One, we never get to tell the harmed group what the proper response to racial injury should be for them. Two, rather than critiquing the strategy, why not simply send a tweet or email demanding an apology? Solidarity is rarely simple, but choosing not to minimize someone else’s struggle is quite easy. By Prachi GuptaBut in the segment, Colbert built the punch line upon a cringe-worthy depiction of a “Chinaman” that went on for long enough to wonder if the humor in the segment was derived from Colbert’s mockery of Dan Snyder, or his actual impression and its finely crafted puns at the expense of Asians. As Brittney Cooper, generally a fan of Colbert, wrote for Salon, “By using language that seemingly sounds like how Asian Americans talk, Colbert’s bit communicated absurdity but also seemed to suggest that all Asians really do speak this way.”And:With more non-white people, more women, more LGBTQ people, more people who are just not straight white dudes, the humor expands to become more inclusive and original. More people will be able to say, “Hey, maybe this is not the best way to present X,” or “This sort of bothers me and might alienate other people, too.” We routinely see edgier stuff coming from diversity in television, and as audiences, we’re less confused about whether what we’re watching is punching down on a minority, or punching up on a minority’s behalf. 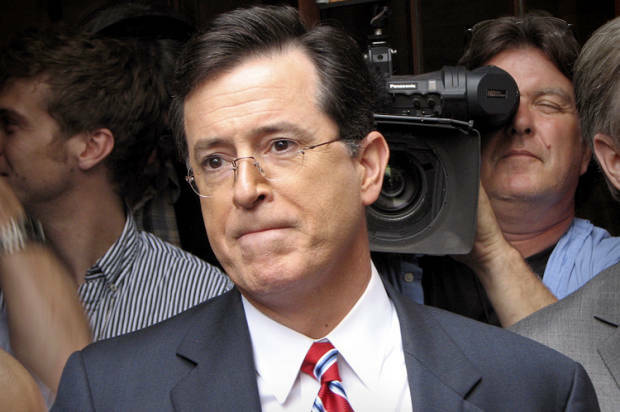 By InitAs an Asian American, I know that what Colbert the persona is saying is racist. Therefore, it’s easy for me to draw the conclusion that because what Colbert is saying is racist, what Dan Snyder is doing is also racist. And were Colbert’s whole audience composed principally of Asian Americans, this would have worked, because everybody is in on the joke. 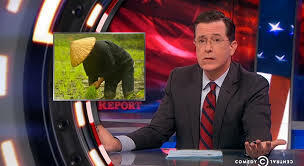 However, where The Colbert Report‘s satire fails is that a significant portion of The Colbert Report‘s audience does not intuitively or instinctively believe in their guts that saying “Ching Chong Ding Dong” or using the term “Orientals” is necessarily racist. Not everybody who laughs at “Ching Chong Ding Dong” is laughing because Colbert the character is so stupidly racist, but they are laughing at Asians. I believe this to be the case because this kind of anti-Asian dialog is still common in our society and is not immediately countered by most of society for being racist. It only becomes a problem, like for Rosie O’Donnell and her ching-chonging on The View, when Asians and anti-racists mobilize and call the offender out on it. In Jonathan Swift’s “A Modest Proposal,” he calls for the sale of Irish children as food for the wealthy in order to resolve poverty. It is unconscionable and undeniably wrong, No one could call for such a thing in society without immediate reaction and knowing that it is wrong. In order to properly satirize Snyder, then Colbert would have to say something that is undeniably racist to the whole of his audience. However, as we know, offense against Asians isn’t undeniably racist to the public because the outrage against the use of the word “Ching Chong Ding Dong” nor the casting of Asians as “sensitive” does not come from the whole of the public, but primarily from Asian Americans and their allies in the anti-racist movement.Comment: This applies to many so-called "satires" of racism. For instance, every time South Park or Family Guy shows an Indian in leathers and feathers. These instances reinforce the dominant stereotypes, not critique them. Many Americans think they're true, not false, so they don't get the so-called joke. Same with the New Yorker cover (above). A substantial minority of Americans thinks Obama is a foreigner and a Muslim. How is it a "satire" to reproduce their false beliefs without commentary? Same with Colbert's "ching-chong" joke. No one knows what percentage of Americans "gets" that Asians talk in a normal voice, not in a sing-song cadence. If the "joke" failed to register with some people, it failed, period. Then there's a whole subconscious level of perception going on. Where do people get the idea that Indians are savages or blacks are criminals? From movies and TV shows--including "satires" such as The Colbert Report. That's true even though people "know," superficially, that stereotypes are false. Deep down, seeing or hearing is believing. People absorb stereotypical messages even when they think they know better. Especially when the messages repeated over and over.